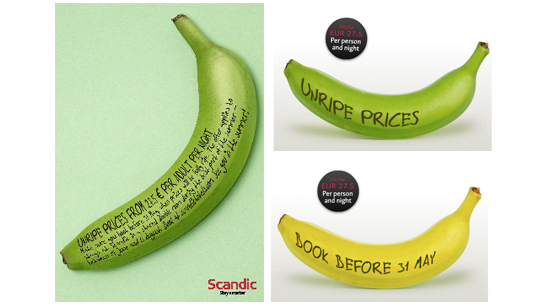 This is an ad campaign for a Swedish hotel, Scandic. The message is “Stay at a Scandic hotel this summer and book before the prices ripen.” The hotel chain is encouraging guest to book rooms early to receive discounted rates. Prices will ripen upon the arrival of summer. That a great idea to promote this bussiness and to have a lot of costumer. Other costumers attrach with the Green Bananas.